It is hard to bring a bustling city to a full stop, but a century ago, this happened to Seattle. Twice. The causes were two distinct events that brought about back-to-back crises. One involved public health; the other concerned public politics. In 1918, the Spanish flu, a whirlwind of disease that took hold during World War I, swept through the world. By the end of its run, it would leave 50 million people dead worldwide, some 675,000 of those in the United States. The flu was spread in this country primarily by millions of troops moving to and from the war. In early October of ‘18, cases were showing up at Camp Lewis (now Joint Base Lewis-McChord) and at the Bremerton naval station and shipyard. The virus quickly spread to the University of Washington campus, and then throughout the city. Public officials responded by quarantining the military camps, banning public gatherings, shutting down theaters, ending dances, eventually even shutting down church services, and closing down poolrooms, restaurants, bars and cafés. Seattle police walked their beats wearing full white face masks below their hats and helmets. They were told to enforce an anti-spitting law. To keep shipyard workers on the job for the war effort, many workers were inoculated. Officials promised that the epidemic would be over in a few days, but such was not the case. Soon, people were warned to avoid crowds of any kind, and the wearing of masks was made mandatory. The crisis lasted until early 1919. I have a personal connection to it. My grandmother, a Scottish immigrant, caught the flu; young people were especially susceptible, and she would have been in her 20s. My then 4-year-old father and his parents were living in a small apartment in the University District. He remembered everyone wearing masks. In an oral history he recorded before he died, he said, “I remember the doctor coming to see [his mother]. She was dry and flushed with fever, and breathing badly, and he apparently gave my dad some bad news because my dad put his arms around me, and we sat in the bedroom a long time. He put me to bed, and I cried because I knew something was going to happen.” His mother made it through the night and after, surviving the Spanish flu. “I was later told,” my dad said, “that two days after Mother’s crisis, the doctor himself collapsed and died” of pneumonia, the result of tending his flu patients. The death toll in Seattle was significant. In a city of about 315,000 people, some 1,400 people died between September 1918 and February 1919. It could have been worse had city, county and health officials not taken steps to shut down the city to slow the spread of the virus. 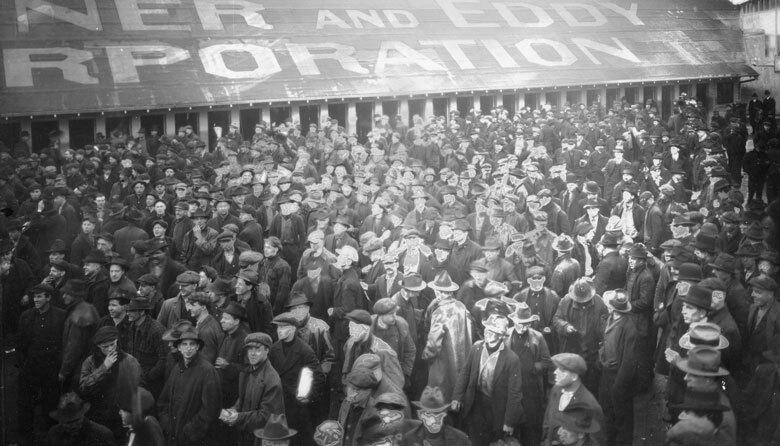 Right on the heels of the pandemic, another crisis occurred: the Seattle General Strike of 1919, the first organized and successful attempt in the United States to shut down a city with a labor walkout. Mainstream unions, led by the Metal Trades Council, which represented the shipyard workers, wanted to strike for higher wages. They had been working during the war under a wage limit, and wanted that lifted now the peacetime had arrived with the Armistice on November 11, 1918. Other unions decided to join in and plan a dramatic, unprecedented general strike that literally would shut down Seattle. In all, some 65,000 workers stopped work on February 6, 1919. It was planned very carefully: Arrangements were made with the city to keep water and electricity flowing. Hospitals would remain open and serve citizens in need. Drugstores would close, but prescriptions would still be available. A group of prolabor veterans—the Labor Guards—would provide security. Milk stations were set up to keep milk flowing to mothers and children. Firefighters would continue to protect. But otherwise, the city would be shut tight. Seattle’s relatively new mayor, Ole Hanson, was still in his first year on the job. He’d gotten the city through the flu crisis; now, he was cooperating, up to a point, with the strikers’ plans. Seattle, after all, was a big labor town. Still, he was uncomfortable with some of the strike’s supporters, which included radicals like the Industrial Workers of the World, known as the Wobblies. Hanson was an anti-communist who touted Americanism. While the strikers had no intention of being violent, Hanson behaved as if the strike reflected a full-scale revolution, an attempt to turn Washington state into an American Soviet state. He deputized and armed some 2,400 civilians to be ready in case of violence. He had machine guns mounted on vehicles to mow down the masses, if needed. He called in troops from Camp Lewis. On the first day of the strike—which lasted only six days—Seattle was buttoned up tight. Everything, including the trolley lines and schools, was closed. The strike ended as various unions decided they’d made their statement of solidarity and their members wanted to go back to collecting paychecks. They didn’t win any concessions from the shipyard owners, but they did feel the warm glow of solidarity. The guy who made out the best was Mayor Hanson, who became a national celebrity for standing up to the “Bolsheviks” and winning. He traveled the country lecturing on Americanism. He made money on these tours, and his head became inflated with visions of running for president in 1920. So, some months after the strike, he quit the mayor’s office to become a kind of early-20th-century Fox News celebrity. He later retired to California. Being Seattle’s mayor is never a cakewalk for any soul. Chronic issues of homelessness or transportation crises (like the upcoming “period of maximum constraint”) pose tough challenges, not to mention the slow-moving menace of climate change. A century from now, it will be interesting to see how future historians regard how we’ve done. Still, it’s hard to imagine a greater one-two punch than the winter of 1918–1919. After having to handle the flu outbreak and a general strike, Mayor Hanson probably found it easy to leave the governing of Seattle behind.